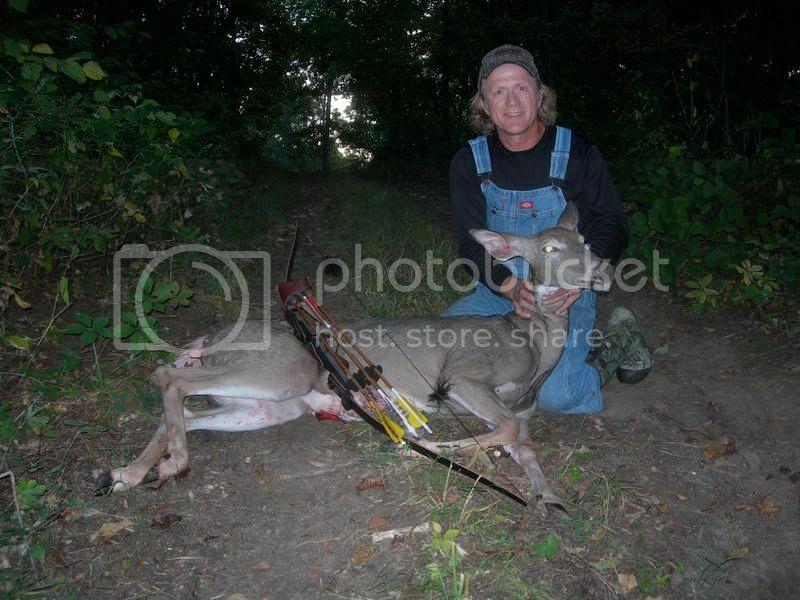 Here is my doe from last evening retrieved this morning, wasnt sure 100 % of the hit , better safe than sorry. 8 yard shot, traveled 50 yards after the shot. A very big girl indeed. Was she wearing a saddle when you shot her? That is one big doe. :eek: Did you put her on a scale? Are they all like that in MN? "Mystic rhythms,Under northern lights or the African sun,Primitive things stir the hearts of everyone"
That is a huge doe. What did she weigh? i did not have the chance to put her on a scale, since she laid out all night and Time was not in my favor to get her in the freezer. This is my 32 year bowhunting and I have only taken on doe which i think was bigger than this girl. She had twin fawns with her and also another dry doe which was not too much smaller! What equipment did you use? COngrats. That is a beauty of a doe, nice shot!! Lots of eats for a while. Currently I am shoot an A & H 3 piece 47 at 28. CE 150 WITH A steel force 125. Good for you! She's a beaut doe. Many happy returns of the day to you.